Much of the talk about Lean and other business improvement systems focuses on the Japanese auto industry, but much of the foundation for that work started with Henry Ford. Ford Motor Company was founded in 1903 with the introduction of the Model A. The Model T was released in 1908 after more than 20 design changes. Ford built his cars to be both easy to use and easy to build with simple, interchangeable parts. Ford may not have used the term “value stream,” but he certainly understood it. After World War II, Toyota learned from the books and work of Henry Ford that had been published decades earlier, but then built upon his work (and combined with other influences including W. Edwards Deming). Sakichi Toyoda has been called the “King of Inventors.” Of course, we associate the Toyoda family with cars, but Sakichi Toyoda’s original claim to fame is the invention of the Japanese power loom. He developed the loom as a way to reduce the amount of manual labor and effort needed for weaving, an industry that employed many members of his family. Sakichi Toyoda’s Type-G loom didn’t just stop when the yarn broke, it also had automatic shuttle change, which reduced the need for human intervention in its normal operations, and was a breakthrough that had eluded everybody else. In fact, the sale of the patent rights for the loom to an English company in 1929 provided the capital necessary for entry into the automotive industry. W. Edwards Deming was an American statistician and professor who became known as a quality and management guru, first through his work with Japanese industry after World War II. A few decades later, he finally received recognition and attention from American companies, including Ford Motor Company, and was featured in an NBC documentary titled, "If Japan Can, Why Can't We?" Deming's books, including Out of the Crisis and The New Economics document and expand upon what he taught Toyota and other companies and management and improving quality. “American management is quick to assign blame to an individual when the problem, is in fact, a fault in the system." Kiichiro Toyoda was the son of Sakichi Toyoda and second President of Toyota Motor Company. It was his decision to move from producing weaving looms into the automobile business. Mr. K. Toyoda was very much influenced by his trips to Ford plants. Like Mr. Ford, he believed in "Just In Time" production and the “pull” of inventory through the production system. Even while still in the loom business, Kiichiro Toyoda understood that continuous improvement was the key to staying competitive. Eiji Toyoda was a younger cousin of Kiichiro Toyoda. E. Toyoda was President of Toyota Motor Company from 1967-1982. Toyoda visited one of the Ford plants in Michigan during the early 1950s. He was impressed by the scale of the facility but recognized significant inefficiencies. To date, Toyota Motor had been manufacturing cars for 13 years and had produced just over 2,500 automobiles. The Ford plant, on the other hand, was making 8,000 vehicles a day. Toyoda decided to adopt American automobile mass production methods but with a focus on quality. 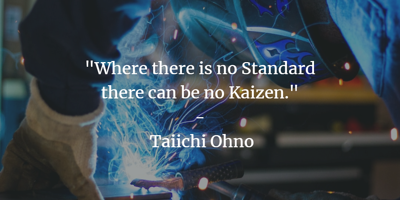 Toyoda, along with Taiichi Ohno developed the initial concepts that became known as the “Toyota Way,” including Kanban, Kaizen, and "respect for people." Taiichi Ohno was a Japanese industrial engineer and businessman. He is considered to be the father of the Toyota Production System, which became known widely as "Lean Manufacturing" in the U.S. He formulated the seven wastes as part of this system. He wrote several important books about the approach, including Toyota Production System: Beyond Large-Scale Production. For our final entry, we list James Womack and Daniel Jones together because they have worked together researching the automotive industry since 1979. Their research with MIT professor Daniel Roos on the automotive industry found a three-to-one productivity difference between Japanese and American factories. Their work led to the book we mentioned at the beginning of this post, The Machine that Changed the World. This book is widely credited with bringing the principles of Lean to boardrooms and factory floors across the United States. Of course, there are many others who contributed to today’s interpretation of Lean Leadership. But if you want to learn more about the evolution and execution of Kaizen in the workplace, reading the work of any of these pioneers is a great place to start.